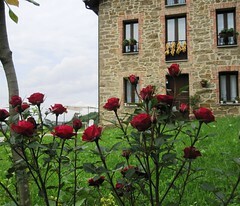 Looking for a house to renovate we found that building composed of two houses and one annex. One of these houses has been since 1931 a school and the other a bar of almost 80 years old. The annex was for years the barbershop. 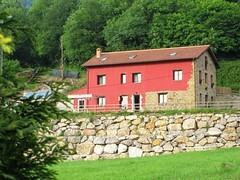 This building is located in a beautiful places close to Tuilla ( Langreo) where was for years an open mine exploitation. The renovation took 2 years. We tried to keep as much as possible the original materials such as stone and wood. Our idea is not only a country house, we want to get that this house would be a meeting place where you can learn, share, enjoy and to be happy. A house where you can get knowledge, hopes and rest to follow with your daily journey.